Coccothraustes coccothrauses Linnaeus, 1758. Three subspecies are recognized. Hawfinches are relatively large, heavy-bodied birds with a massive beak; they have a stocky, top-heavy appearance. Their body length is about 7 in (18 cm) and they weigh about 1.9 oz (54 g). The male has a black back, wings, and tail, is chestnut on the head and belly, and has a black chin and blue beak. The female is somewhat duller. The massive beak and skull design allow hawfinches to crack open large, tough seeds, such as those of cherries and olives. 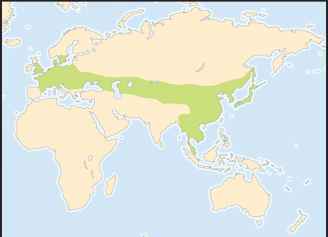 Hawfinches are found throughout much of the temperate and southern boreal regions of Europe and Asia. Hawfinches occur in hardwood and mixedwood forests of various kinds, in addition to well-vegetated parks and gardens. Hawfinches are shy birds that are wary of noise and movement. The male has a rather soft, feeble song that is used to defend its breeding territory. Hawfinches eat seeds and fruit, including tough nuts and fruit-stones. They sometimes feed on the ground on fallen fruit, but are wary when doing so. Hawfinches have an elaborate courtship ritual, involving the drooping of a wing to display iridescent purple and green flight feathers. The male also bows deeply to a prospective mate and tucks his beak under his belly, revealing a gray nape patch. Aerial chases between a male and female are also part of pair formation. Hawfinches often breed in loose colonies. 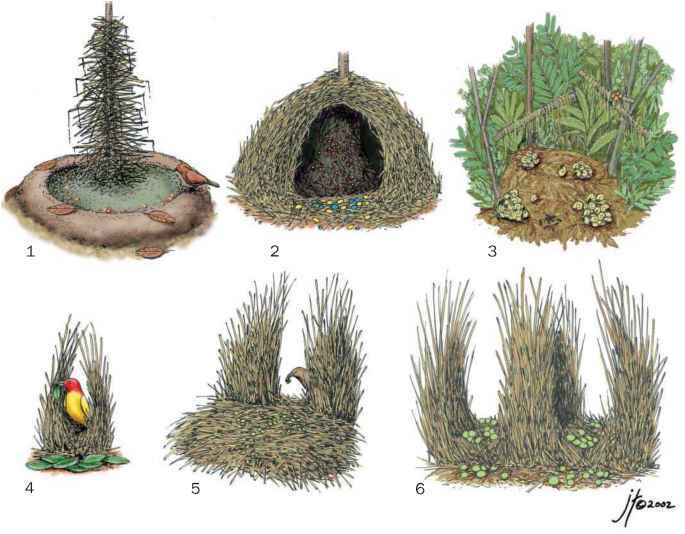 Their small, cup-shaped nest is built of roots, twigs, and lichens. It is lined with plant fibers, hair, and rootlets, and placed low in a tree. Three to seven greenish eggs with blackish brown markings are incubated for 9-14 days, mostly by the female. The young are brooded by the female and tended by both sexes. Fledging occurs in 10-14 days. Not threatened. Hawfinches are a widespread and abundant species, but they are vulnerable to habitat loss due to logging operations.